30/7: MSF is informed about suspect cases of Ebola near Beni/Mangina, North Kivu. On 31/7, an MSF team from the nearby project in Lubero (roughly three hours away by car) arrives on site (with the Ministry of Health) to investigate. 1/8: The Ministry of Health declares an Ebola outbreak in Mangina, North Kivu, in north-eastern Democratic Republic of Congo. 6/8: An MSF isolation unit is installed in the Mangina reference health centre, trainings are held on the use of personal protective equipment (PPE), triage, and infection prevention & control (IPC). 7/8: Results of genetic analysis from the national laboratory confirm that the circulating virus is of the Zaire species, but a different strain from the one reported in the Equator outbreak earlier this year. 8/8: Vaccination of frontline health workers begins under WHO’s supervision (not done by MSF). 14/8: MSF’s treatment centre opens in Mangina (in tents 300m from the isolation unit). 37 suspected and confirmed cases are admitted on opening day. Originally designed for 30 beds, its capacity has immediately been extended to 68 beds and can be extended to 74 if needed. 14/08: Decontamination of the local health centre in Mangina and other health centres where confirmed cases had transited. 24/08: MSF begins offering therapeutic drugs to eligible patients in the ETC in Mangina. 28/08: MSF opens a transit centre in Makeke. 08/09: MSF opens an isolation centre in Butembo and begins building an ETC. 09/09: MSF sends a team to Louto (one hour from Lumbero) to investigate a recent case. 19/09: Makeke transit centre closes, because a new ETC opens, constructed by IMC. 20/09: MSF opens a 28-bed (12 isolation, 16 hospitalisation) ETC in Butembo in partnership with the Ministry of Health. 22/09: An attack attributed to ADF makes at least 19 dead (of which 14 civilians) in Beni. The following week, Beni is declared ‘ville morte’ and Ebola response activities come to a virtual stop. 24 /09: MSF sends a team to Tchomia, on Lake Albert in Ituri, following notice of 2 confirmed cases. MSF sets up an isolation unit and, with the Ministry of Health, prepares to set up a 12-bed ETC. 27/09: MSF ends its presence in Loutu as no new cases have appeared. 12/10: Opening of the CTE in Tchomia. 17/10: WHO discusses whether the situation is a Public Health Emergency of International Concern (PHEIC) but announces publicly that for now, no PHEIC will be declared. 20/10: An attack attributed to ADF in Beni’s Rwenzori area makes at least 12 dead. Ten people are also reportedly abducted. On the next day, Beni is declared again “ville morte” and some demonstrations happen in the city. On Monday, all activities restarted well. Mangina, the first epicentre of the outbreak, (40,000 inhabitants) is located in North Kivu, in north-eastern Democratic Republic of Congo. Beni, the administrative centre of the area, is now the epicentre of the epidemic, 32 km away (45 minutes by car) and is home to approximately 420,000 inhabitants. Butembo, located to the south, is a city of about 1 million inhabitants. The region of North Kivu is a densely populated area of conflict, where more than one hundred armed groups are estimated to be active. Moving around some areas in the region is quite difficult and sometimes impossible. Kidnappings and car jackings are relatively common and skirmishes between armed groups occur regularly across the area. While most of the urban areas are relatively less exposed to the conflict, attacks and explosions have nonetheless taken place in Beni as well, sometimes limiting MSF action. North Kivu shares a border with Uganda to the east (Beni is approximately 100 km from the border). This area sees a lot of trade, but also traffic, including ‘irregular’ crossings. Some communities live on both sides of the border meaning that it is quite common for people to cross the border to visit relatives or trade goods at the market on the other side. The outbreak has spilled in to the neighbouring province of Ituri, but the majority of cases still occurs in North Kivu. * ‘Probable’ refers to community deaths that have links to confirmed Ebola cases but which were not tested before burial. Ten health zones in North Kivu and Ituri provinces (Mandima, Mabalako, Beni, Oicha, Butembo, Kalunguta, Komanda, Masareka, Musienene and Tchomia) have so far reported confirmed or probable cases of Ebola. More than ten weeks after the declaration of the epidemic, we seem to be facing a second peak of the outbreak: the epicentre has now moved from the small village of Mangina to the much bigger city of Beni, where the number of confirmed cases has shown a clear increase in October. Therefore, the epidemiological situation in North Kivu is more concerning now than it was in September, when the number of cases appeared to be decreasing. Another reason for concern is the geographically scattered pattern of the outbreak. A new case emerged in Tchomia on 20/09, 60 km south of Bunia in Ituri province, as well as in Komanda (45 km east of Bunia). One of the infected patients died in the hospital in Tchomia and was probably infected in Beni before travelling all the way up north. The epidemic is very close to the Ugandan border, increasing the risk of a spill over into this country. Epidemiological teams are still working on identifying all active chains of transmission. This is not simple given that the local community in the affected areas is highly mobile and moves from village to village for work and family reasons, as well as to seek healthcare. Sick people have been known to visit more than one health centre before being identified as suspect cases and referred to an Ebola Treatment Centre. Since the beginning of the outbreak more than 8,000 contacts have been identified and more than 2,732 are currently being followed up by the Congolese Ministry of Health. The contact tracing and follow-up is done by the Ministry of Health with a team of epidemiologists. Retrospective investigations point to a likely start of the outbreak back in May. The delay in alert/response can be attributed to several factors, including a breakdown of the surveillance system due to strikes by local health staff whose salaries had not been paid for several months, as well as the difficult security situation (limitations to movement, difficulty of access). The initial alert came after a woman from Mangina was admitted to the local health centre on 19 July for a heart condition. She was discharged but died at home on 25 July with symptoms of haemorrhagic fever. Members of her family subsequently developed the same symptoms and died. A joint Ministry of Health/WHO investigation on site found six more suspect cases, of which four tested positive. This result led to the declaration of the outbreak on 1 August. The national laboratory (INRB) confirmed on 7 August that the current outbreak is the Zaire species of the virus. This is the most deadly species, but also the one for which a vaccine and treatments are in development. It is the same species that affected West Africa in 2014-2015 as well as Equator province, in western DRC, earlier in 2018 – although the virus’ strain was different from one outbreak to another. At the Ministry of Health’s request, MSF is part of the task force coordinating the intervention and is focusing on caring for patients affected by the virus, vaccination of frontline workers, as well as protecting local health structures (and their workers) by helping with triage, decontamination and trainings. MSF is also supporting surveillance activities. In total, more than 100 staff members are currently working in MSF’s Ebola projects in North Kivu and Ituri. 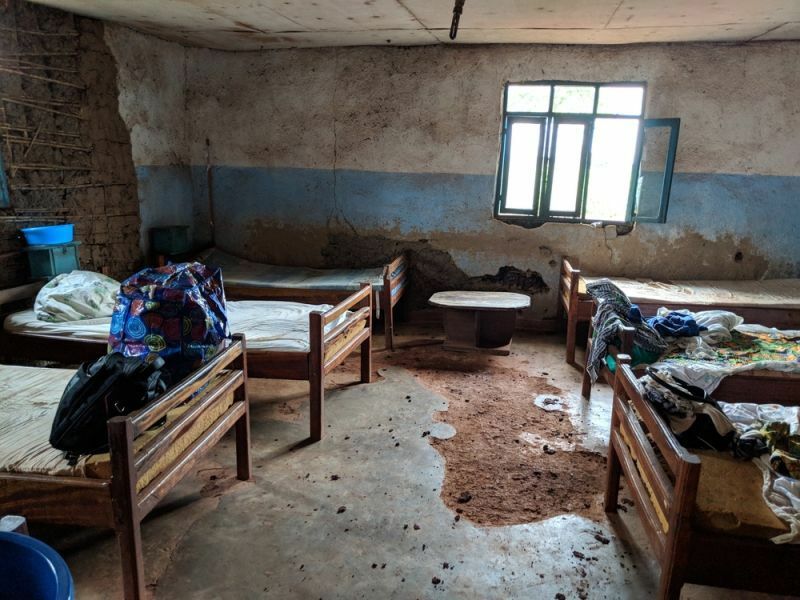 MSF first helped to improve an isolation unit for suspect and confirmed cases that the local staff had quickly set up in the Mangina health centre, the first epicentre of the outbreak, where patients were isolated and cared for, while a treatment centre was being built. The treatment centre opened on 14 August. The centre had initially a capacity of 68 beds; it has since been reduced to 24 beds as the volume of activity in Mangina has dwindled and the focus of the outbreak shifted to other areas. Another isolation centre, was built by MSF in Beni and handed over to the Ministry of Health, who assigned it to another NGO – it is now a treatment centre. A second ETC built and run by MSF is operational in Butembo, a town estimated to be home to 1,000,000 people which has seen imported cases from Beni. 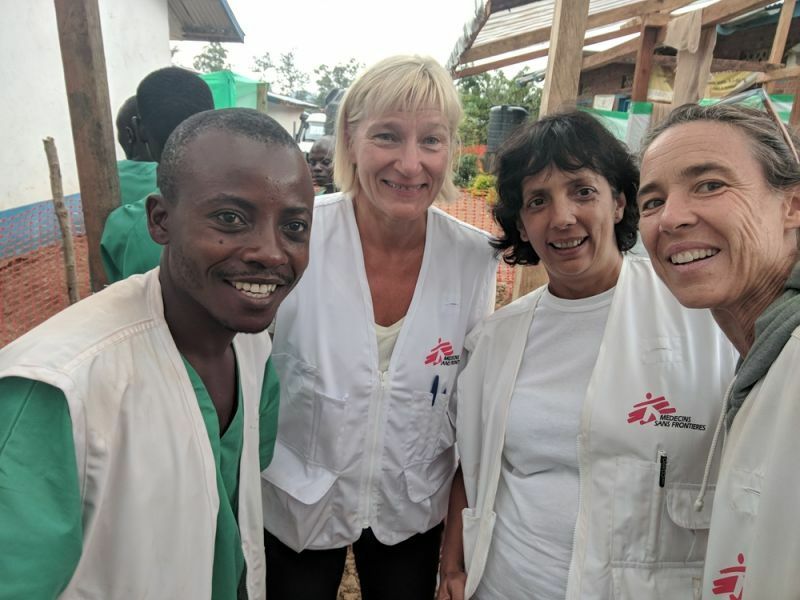 MSF responded to the alert by setting up an isolation centre in a local hospital, followed by an Ebola Treatment Centre – jointly operated by the MSF and the Ministry of Health – on 20 September. 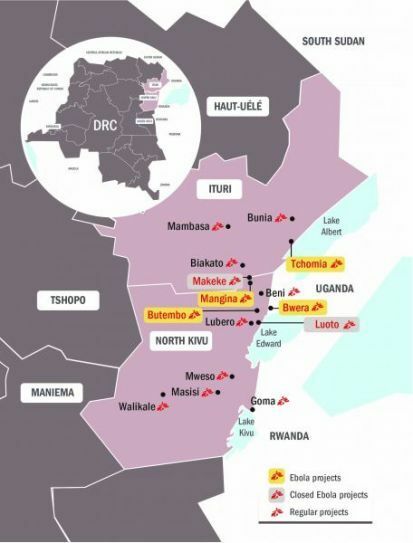 A third ETC was opened on 12 October following the appearance of confirmed cases in Tchomia, Ituri Province, on Lake Albert (on the Ugandan border). MSF is currently supporting the Ministry of Health personnel working in the centre by providing training and technical expertise. MSF also operated for a few weeks a 7-bed transit centre in Makeke (on the North Kivu-Ituri border), where suspect patients could be isolated and tested for the virus and transferred to Ebola Treatment Centres in Mangina or Beni. The centre has now been closed because the Ministry of Health and IMC (International Medical Corps) opened an Ebola Treatment Centre in Makeke. In these ETCs, MSF teams have been progressively increasing the level of supportive care (oral and IV hydration, treatment for malaria and other coinfections as well as treatment of the symptoms of Ebola) and have also been able to offer new potential therapeutic treatments to patients with confirmed Ebola infection under the MEURI protocol. A team of clinician makes the choice on an had hoc basis between five potential drugs (Favipiravir, Remdesivir (GS5734), REGN3470-3471-3479, ZMapp, mAb114 and Favipiravir). The treatments are given only with the informed consent of the patient (or a family member if they are too young or too sick to consent) and are provided in addition to the supportive care. These five drugs have not passed clinical tests yet and we are unable to measure their efficacy - yet their utilization has been approved by the ethical committees of the Ministry of Health and MSF, because it is believed they may improve a patient’s chances to survive. While caution must be exercised, these treatments are an added resource to the response. Because of their untested status, their utilization is subject to a strict protocol which places particular emphasis on the informed consent of the patient. Discussions on the implementation of a proper clinical trial are ongoing. In addition to patient care in ETCs, MSF is active in several pillars of the Ebola intervention. Health centres in Mangina and Beni that have seen positive cases are being decontaminated – MSF is also involved in these infection prevention and control activities. Furthermore, there are MSF teams working in the Beni and Mangina areas as well as in Ituri, between Mambasa and Makeke (on the border with North Kivu) and Bunia – Tchomia axes, visiting health centres and training staff on the proper triage of Ebola suspects, as well as setting up isolation areas in case of need and providing material for all these activities. 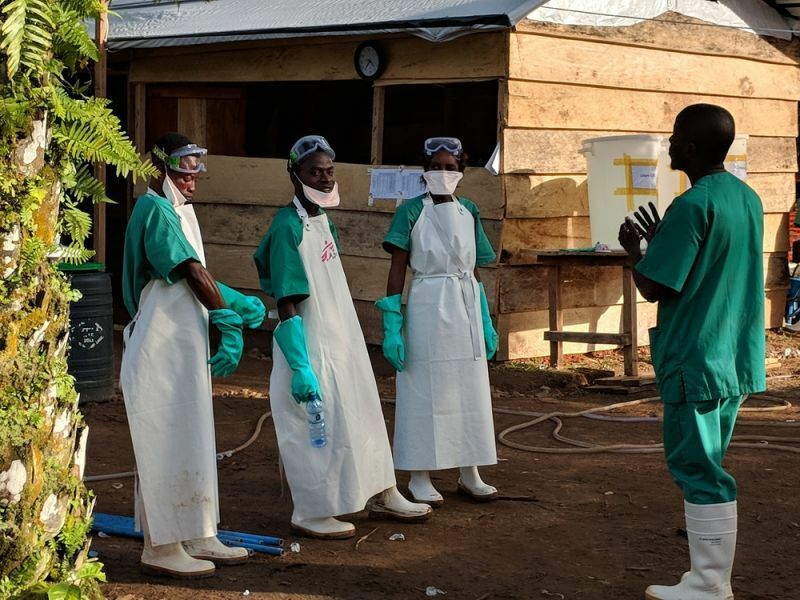 One of the critical components of the Ebola response is the ability to react quickly to new alerts, being able to investigate them and decide on setting up new structures for the intervention: for this, MSF set up a Rapid Response Team composed of a doctor, nurse and water and sanitation expert. Further south in North Kivu, on 9 September MSF sent this rapid response team to Luotu, a village outside of Lubero, in response to alerts of a positive case. The team was not only involved in case investigation but also in building a small isolation unit in an existing structure to receive suspect cases. The positive case had spent time in the health centre before dying at home, many of the health centre staff, as well as family are high risk contacts. Fortunately, no confirmed cases were registered and MSF withdrew its staff on 27/09 from this centre, leaving the structure to the Ministry of Health. The same team was deployed to Tchomia when the first confirmed case appeared there. MSF is also vaccinating frontline workers (health staff, religious leaders, burial workers etc.) from Makeke on the Ituri-North Kivu border up to Biakato. Given that the population from Mangina move often in this direction, it is hoped that this vaccination will help to stop the infection spreading further into Ituri. So far, 360 frontline workers have been vaccinated by MSF. On Thursday 18 October MSF has also started vaccinating frontline workers in the city of Beni. Two MSF teams in Beni support the teams of the MoH/WHO, who decide on the strategy of this pillar. The MSF teams screen local health structures. MSF health promotion teams in Beni work in support of the IPC teams and vaccination teams, as these activities require intensive communication with the community. The HP teams are also in contact with local leaders of several health zones, to exchange information about Ebola and the community. MSF’s teams in Uganda have been mobilized to be ready in case the outbreak spills over across the border. They have installed an isolation tent in Bwera, a small town directly across the border from Beni and Butembo. MSF’s regular project in Hoima (Uganda) has also set-up an isolation tent. MSF is also supporting the government of South Sudan to prepare for a possible scenario of Ebola appearing in the country. Likewise, all MSF regular projects in the North Kivu and Ituri areas have also been supplied with Ebola equipment including PPE and have put proper hygiene and infection control protocols in place to safeguard staff and patients from the risk of contamination should the epidemic spread further. MSF remains ready to support the authorities of these – and other – neighbouring countries in the implementation of their response to the Ebola outbreak in DRC. The Ministry of Health (MoH) is leading the response so all of our activities are done in conjunction with them, DON’T FORGET THIS. The situation in North Kivu is concerning, particularly in Beni, where the number of cases has increased significantly since the beginning of October. Many of these new cases are not on the lists of people who were contacts of other Ebola patients, and known to be at risk. 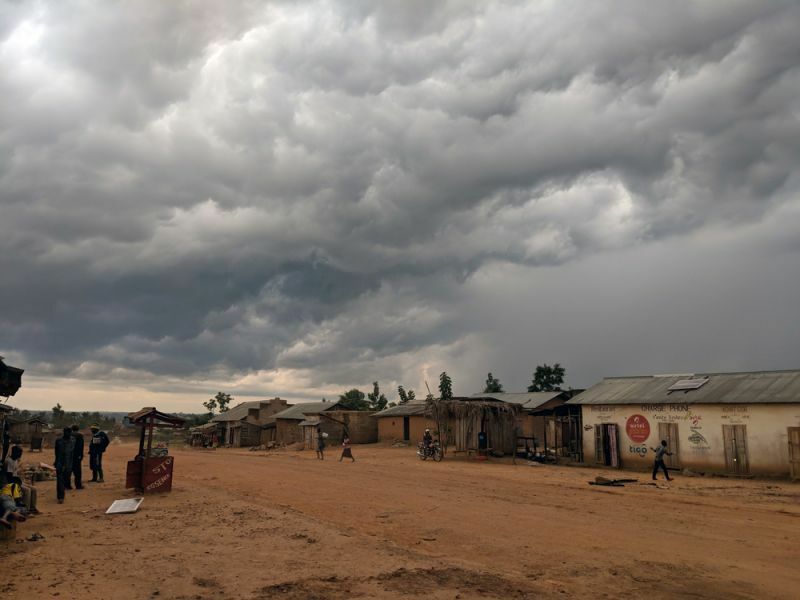 In Butembo, a city estimated to be home to approximately 1,000,000 people, the number of cases is also slightly increasing, and it is also concerning to see the outbreak spread to Uganda border on Lake Albert and other areas. Epidemiologists are still working on identifying all active chains of transmission. This is not simple, given that some cases have occurred in highly insecure areas and local people move frequently between villages and towns for work and family reasons. Some also prefer return to their villages of birth when they are sick or fear they may die. 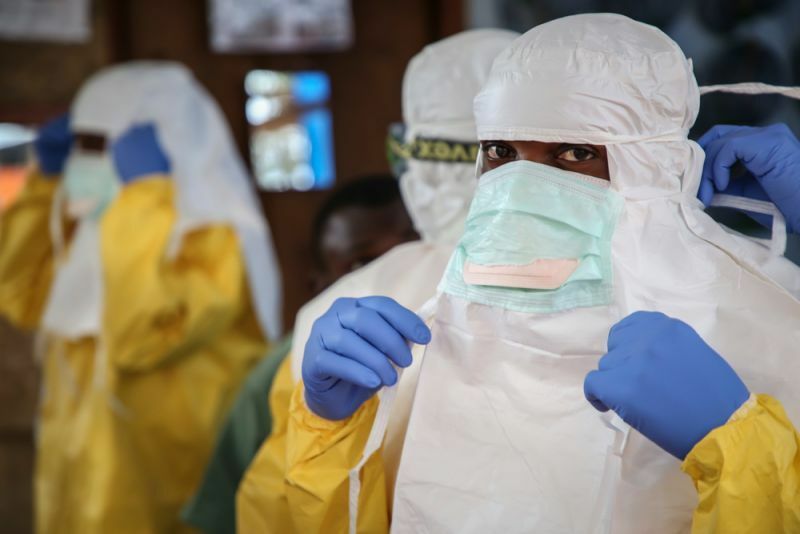 One of the most important parts of any Ebola epidemic is earning the trust of the community. This is done through transparency and good communication and is critical in implementing the core pillars of the response: isolation and proper care for the sick, surveillance, health promotion, contact tracing, safe burials and the protection of the regular health care system. Significant efforts are needed to improve the trust of the local communities, especially in Beni. In every Ebola outbreak, we face issues of resistance from a community that is afraid and uncertain. This is understandable, because Ebola is a terrifying disease, and it is our job to convince people who are afraid why it is so important that the sick come to an ETC where they can be offered a developmental treatment and keep their loved ones safe from infection too. This lack of trust is understandably exacerbated in a context that has suffered violent conflict for many years and where mistrust of population towards authorities is deeply rooted. The insecurity is making relief activities more complicated. The insecurity due to the ongoing conflict in the region makes it more difficult to contain the epidemic. Activities have had to be suspended at times due to insecurity, which has interrupted contact tracing or outreach activities. After a violent incident in Beni on 22 September, the city was declared ‘ville morte’. During this period, following up with contacts of Ebola patients to see if they’ve fallen ill could not be followed during several days. On 20th October, an attack in Beni’s Rwenzori area makes at least 12 dead. On the next day, Beni is declared again “ville morte” but all activities restarted well afterwards. Then there are so called ‘red zones’, areas where we can’t go because of the insecurity. Some contacts of Ebola patients gone to these areas and we don’t know if they sick or not, or if others have also fallen ill or not. The violence against health workers in recent weeks is also very concerning, particularly against teams performing safe burials, a very difficult job where it is hard to explain to communities why it must be done in a safe way that is not in line with local traditions. All these factors make it harder to control the epidemic. Bambo: ER, paediatrics, nutrition and support 3 health centres. Kibirizi: ER, paediatrics, nutrition and support 2 health centres. Lubéro: ER, paediatrics, nutrition and support 2 health centres. Rutshuru (planned): surgery, ER, paediatric nutrition. Goma: HIV support at Virunga Hospital + 5 health centres, Eprep for mass casualty plans, cholera treatment centres. Mweso: support 12 health centres and the general hospital. Walikale: general hospital on pediatric, nutrition, maternity and laboratory services and 4 health centres. Bunia: support to 9 health centres in 2 health zones - primary healthcare and referrals. Mambasa: medical care for victims of sexual violence and treatment for sexually transmitted infections (The regular project in Mambasa is currently on standby, with teams supporting the Ebola intervention). Lulingu: post-conflict assistance to both displaced and host communities in the area. Kalehe: primary and secondary health care. Mulungu-Kaniola: primary and secondary healthcare, EPI, pediatrics, referrals. These figures refer only to the number of patients that were admitted in the ETC’s where MSF is present.